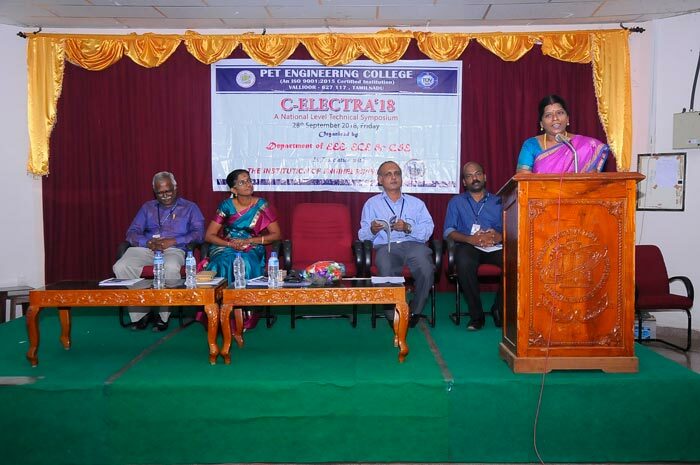 A National Level Technical Symposium C-Electra was organized by the Departments of CSE, ECE and EEE in association with the Institution of Engineers(INDIA) at PET Engineering College, Vallioor on 28th September 2018. 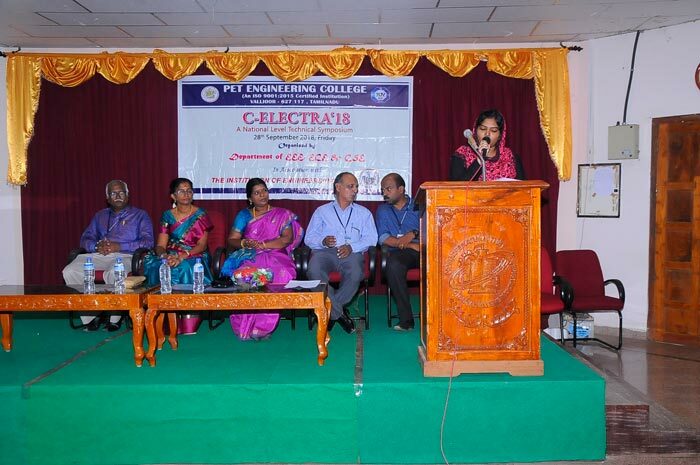 Ms. N. Rishma Begum, a final year ECE student welcomed the gathering. 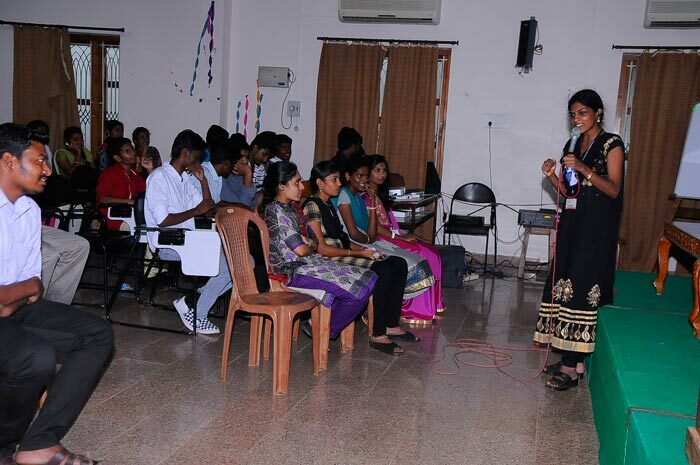 Ms. H. Faiza Mubeena, a final year CSE student gave a brief introduction about the Symposium to the audience. 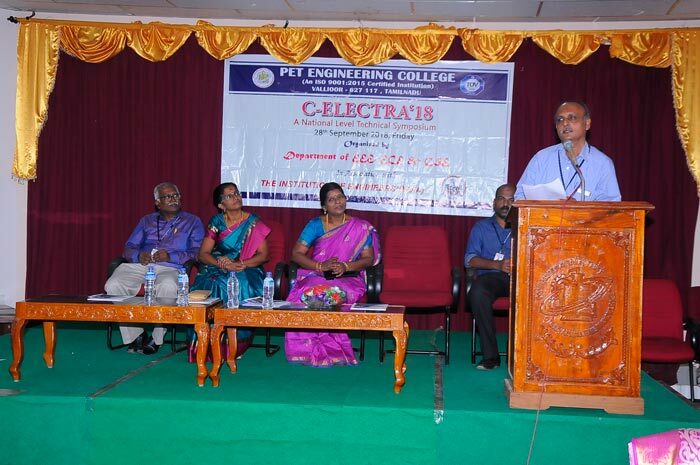 Dr. N. Mohamed Sheriff, the Principal of the College delivered the presidential address. 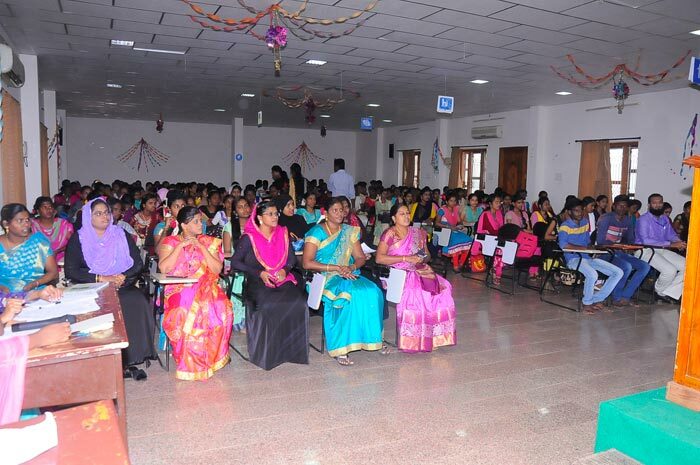 The Principal hinted upon the industrious nature of the Japanese and promoted the students to follow them in being innovative and an expert in technology. Life has its own obstacles and that is the reality. 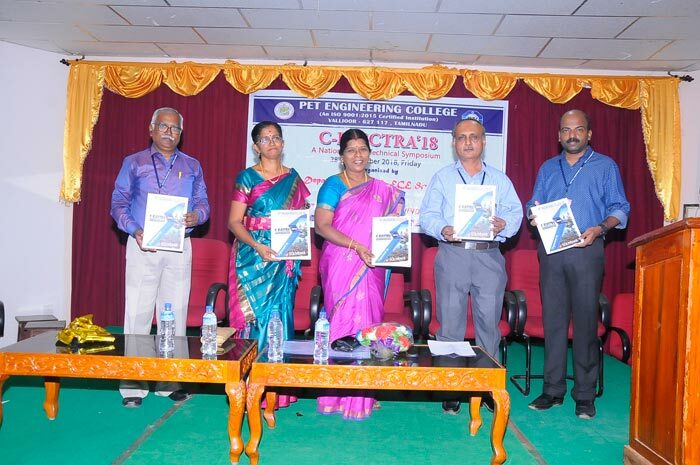 He emphasized that striding those constraints gives you contentment. 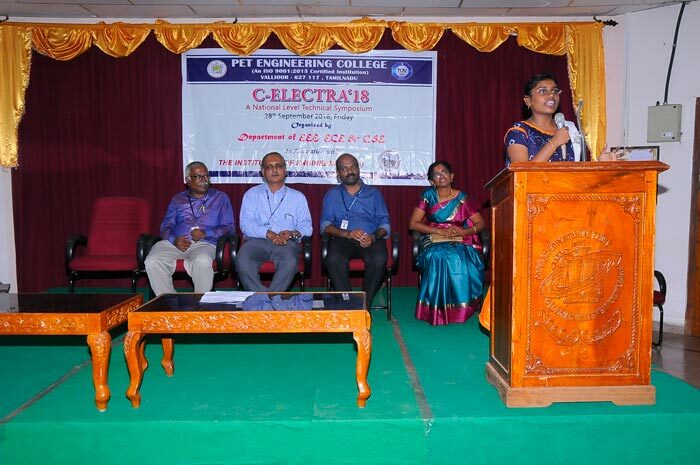 Ms. J. Preethi, an III year EEE student introduced the chief guest Dr. P. Latha, Professor & Head of the Department of EEE, Government College of Engineering, Tirunelveli. 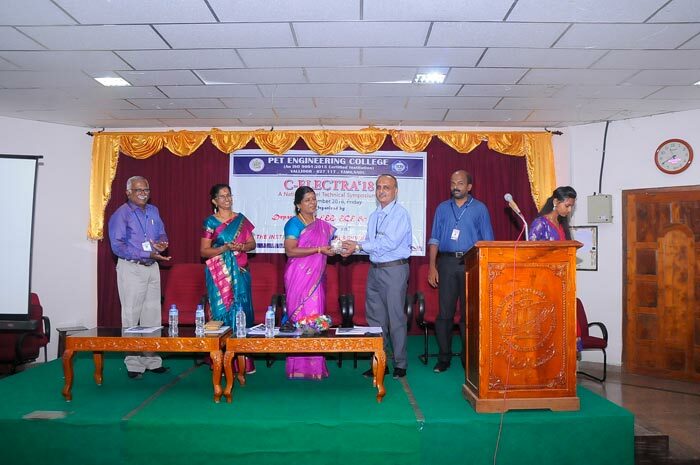 Dr. P. Latha, inaugurated the Symposium and delivered the inaugural address. 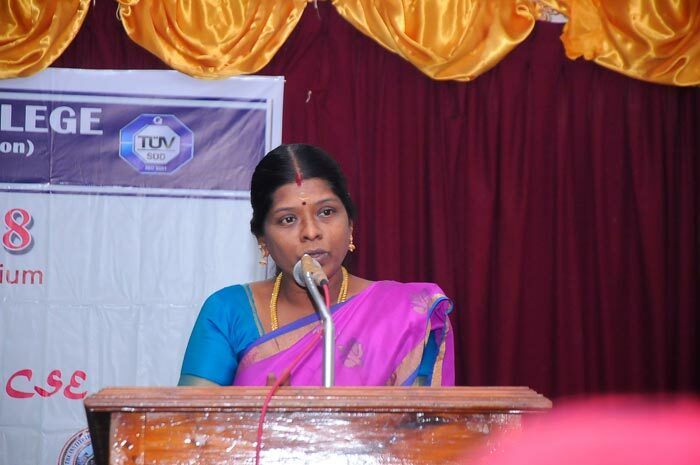 She spoke on the topic Internet of things. 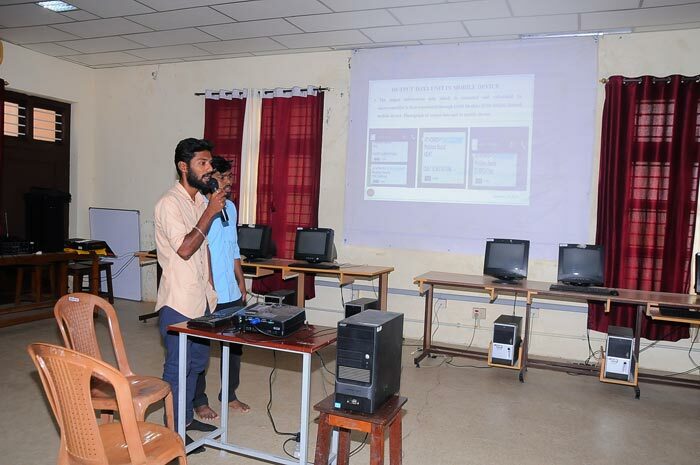 She elucidated on the merits of application of IOT in different fields like agriculture, medicine and other walks of life. 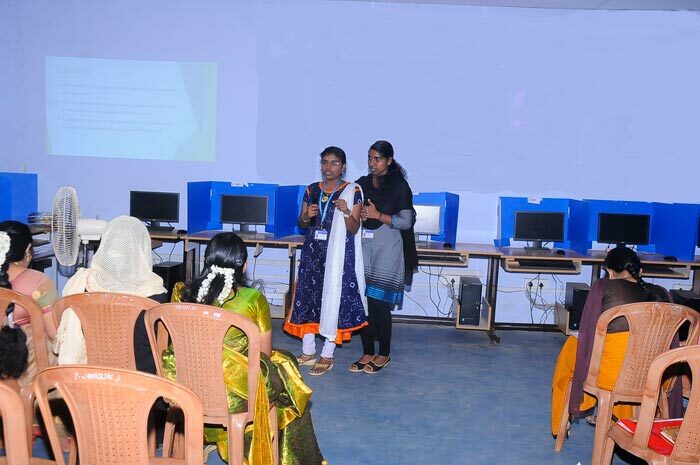 She encouraged the students to take part in implant training, internship programs, online certification courses, GATE exams etc. 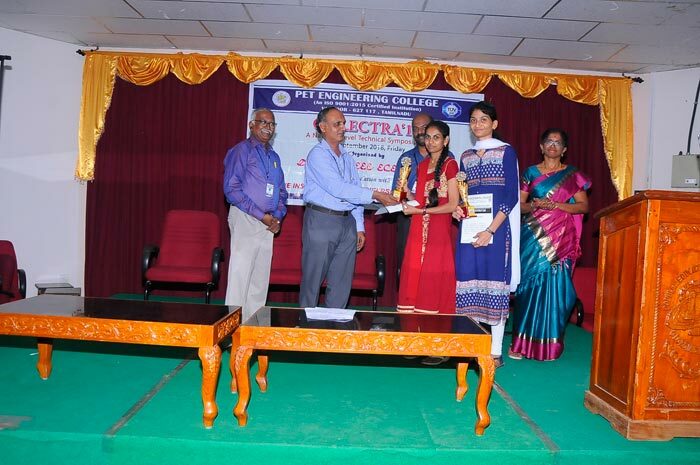 so as to groom themselves to attain prestigious position in the society. 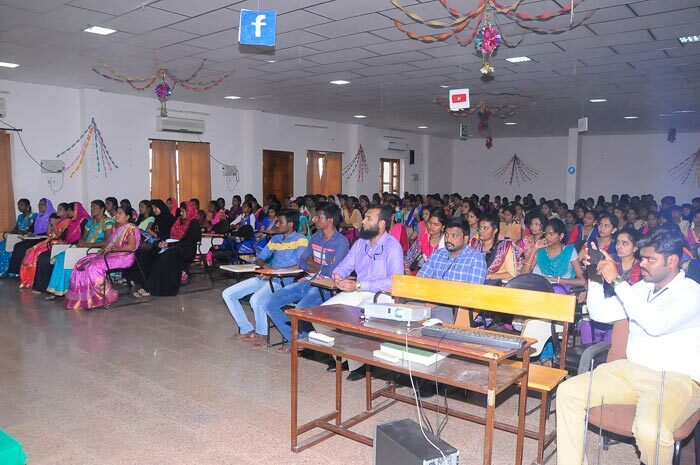 Further, she pointed out that to reach one�s goal and get successfully placed one should be firm in fundamentals and strong in communication. 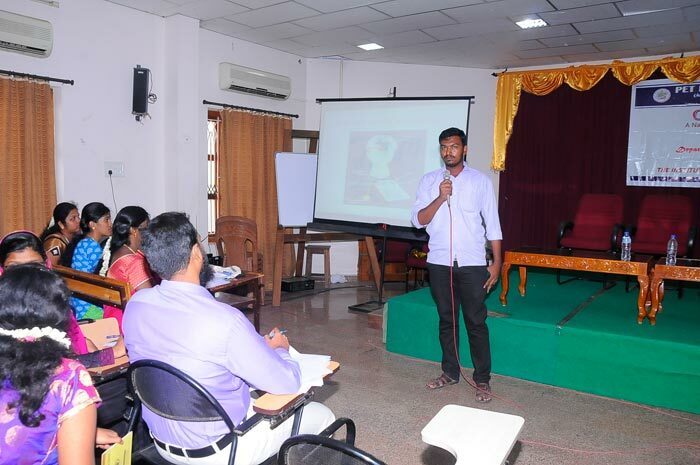 And also, procuring one�s wish is not an easy task; one should be multi-faceted to suffice one�s wish to reach the pinnacle of success. 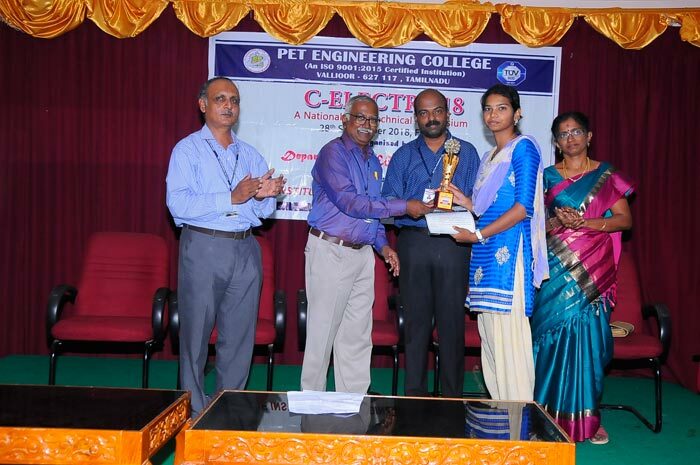 The Principal released the Souvenir and it was received by the chief guest. 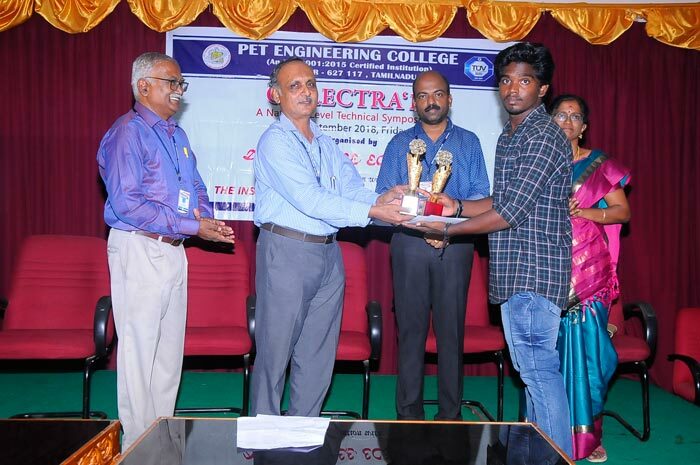 Several contests like Paper presentation, Bug Smasher, Hogwarts, Best Manager were held. 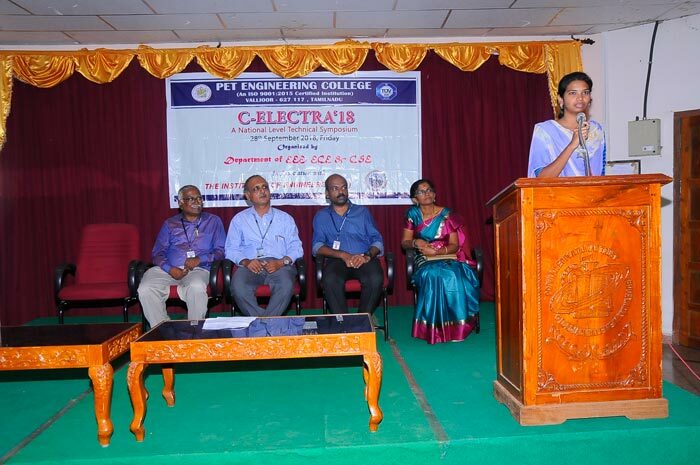 Nearly hundred scholars of different Engineering Colleges attended the Symposium. 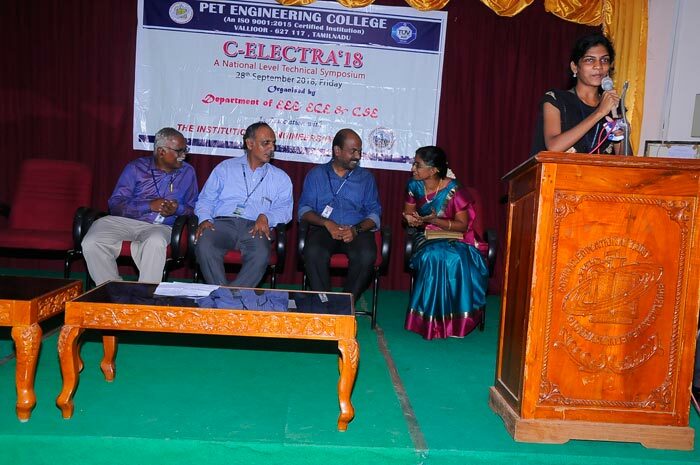 Ms. A. S. Rashmi , a final year CSE student proposed vote of thanks.Dr. 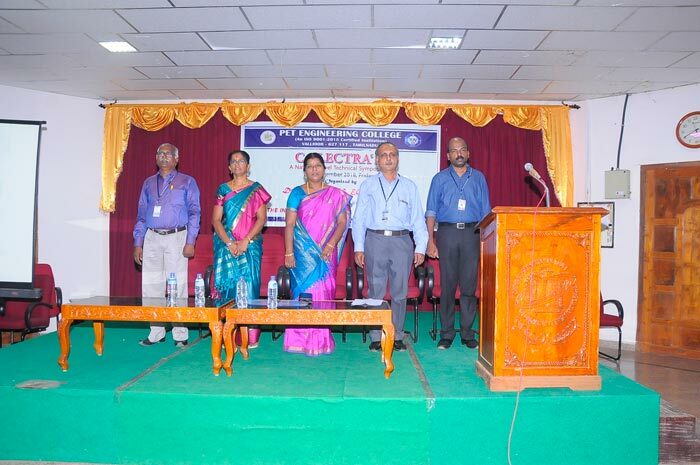 K. Madhan kumar, Head of the Department of ECE coordinated the event.